By 1770, the citizens of Boston refused to pay import taxes on many British products. Leading merchants conspired together and ostracized any person that continued to sell boycotted products. Merchant Theophilus Lillie ignored the boycott. 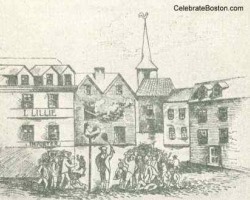 On February 22, 1770, Ebenezer Richardson, a Loyalist informer, attempted to destroy an effigy outside Lillie's shop. Richardson caused a great scene and a mob gathered, driving him to his house. Debris was thrown back and forth between Richardson and the crowd, and the mob began to violently storm the house. Richardson fired several shots at random from his window, killing eleven year old Christopher Snider. "This innocent lad is the first, whose LIFE has been a victim to the cruelty and rage of Oppressors! Young as he was, he died in his country's cause, by the hand of an execrable villain, directed by others, who could not bear to see the enemies of America made the ridicule of boys The untimely death of this amiable youth will be a standing monument to futurity, there the time has been when innocence itself was not safe! The blood of you Allen may be covered in Britain: But a thorough inquisition will be made in America for that of young Snider, which crieth for vengeance, like the blood of righteous Abel. And surely, if justice has not been driven from its seat, speedy vengeance awaits his murderers and their accomplices, however secure they may think, themselves present: For those whose sheddeth, or procureth the shedding of Man's Blood, by MAN SHALL HIS BLOOD BE SHED." Public outrage culminated two weeks later on March 5th, with the Boston Massacre being the result. Snider's death was a significant factor in initiating armed conflict with Great Britain. The serpent is lurking in the grass. The fatal dart is thrown. As well the harmless blood I've spilt. In sending Snider out of time! O help me Lord, I see his ghost. Theophilus Lillie wrote that the mobs of Boston were contrary to any law abiding governing body. That he would rather be ruled by a single tyrant, than by a hundred. Ebenezer Richardson was arrested and found guilty of murder. He was later pardoned by the King after spending two years in jail. An account of Snider's murder is reproduced from the February 26, 1770, Boston Evening Post.